GNOM-baby — an unusual underwater device for professional and amateur use! GNOM is a revolutionary remote-controlled underwater vehicle (ROV). 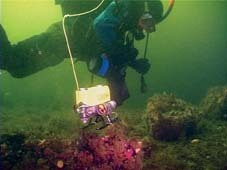 The advanced technology used in the GNOM, made it portable, lightweight, easy to operate and affordable like no other ROV in the world! GNOM — the first personal ROV all over the world. It has 3—5 times less power consumption than other small size ROVs, built-in battery and videomonitor/recorder, all is packed in two cases, weight of complete system is 15—25 kg only. Very thin cable (2—3 mm diam) allows real working in a depth till 150m. You can take it with you as a hand lagagge, and you need nothing more to start work — all is ready to use! 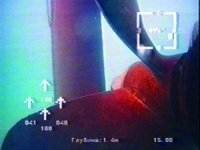 We are 6 years on a market and have a big experiance of underwater works with GNOMs, which we use in order to make many improvements. More than 230 units sold to many customers in Russia, Ukraine, Poland, France, Italy, Germany, Spain, USA, India and other countries. GNOM has User's manual contains many technical details and recommendations for users. We support our users with information and service. 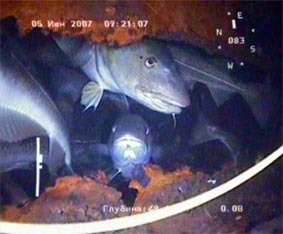 To get more info about other GNOM ROVs please go to our website gnomrov.com. GNOM-Baby can be equiped with some extra items. Personal glasses are very useful during the field work. Logitech Cordless Action Controller Joystick increases steering ease of the vehicle. Movable lift point Movable lift point aloud to reel on/reel off the cable on a cable frame during the vehicle operation. This is a special proprietary designed cable frame. Cable up to 200 m, diameter 3 mm. Two cases are necessary for installation of the complete set of the equipment. Remote control GNOM-baby — online! ROV GNOM-baby in in the pool, you can control the device remotely right from your browser — in real time! GNOM-Baby technical information, data sheets, cpecifications, drawings. The manual for each product can be various. It depends on year of release and an equipment complete set. The actual manual is delivered together with the equipment. For more information please send mail to support@babygnom.com. Institution of Oceanology Russian Academy of Science named after Shirshov.